As you know, it is my philosophy that every student’s dream matters. I believe the role of Lorain County Community College is to help our students achieve their dreams – no matter what the student’s challenges are. The question seemed simple enough. Of course, where a person begins their life should not define where they end up. And yet, that’s exactly what we are faced with here in Northeast Ohio and in many other areas around the country. In fact, a child born in Lorain County to a family with an income in the bottom 20 percent has only a five percent chance of making it to the top of the income ladder by the time they reach adulthood. A five percent chance. That statistic stopped me in my tracks. If social and economic mobility is the American Dream, then the American Dream is in serious jeopardy right here in Lorain County. 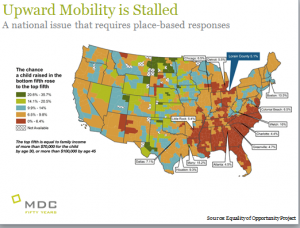 See the map and full data on the Equality of Opportunity Project website. Thankfully, a college degree can be the golden ticket out of poverty. According to research by the Pew Charitable Trust, earning a post-secondary credential dramatically lessens the chances that a person born at the bottom will remain at the bottom. Without a college degree, there is a 47 percent chance the person will stay stuck in the bottom half of income distribution. By earning a college degree, the likelihood of remaining at the bottom shrinks to just 10 percent. Read the Pew Charitable Trusts’ full report on economic mobility. Lorain County Community College was founded to serve the community and provide access to higher education for Lorain County. These statistics on social mobility drive home more than ever the importance that all people in our county must have an equitable opportunity to achieve their goals through higher education – regardless of their race, age or economic position. And while there is a long way to go, we have made great progress in recent years in helping local people access the education needed to reach their goals and provide for a better future for their families. 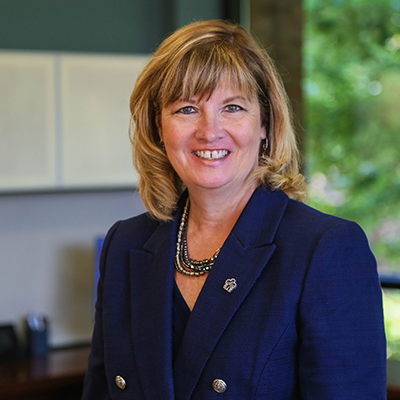 In the past 25 years, degree attainment in Lorain County has risen from 19 percent of Lorain County residents with an associate degree or higher to 33 percent of residents with a degree. To achieve this 14 percent increase, we’ve revamped advising models and restructured developmental courses to better serve the needs of students and decrease the amount of time it takes to earn a degree or credential. Additionally, the College Credit Plus program at LCCC has expanded course offerings and partnerships with local school districts, leading to 43 percent of Lorain County high school seniors to graduates with college credit in 2017 – credits they earned for free. These statistics are great, but it’s the real people behind them that matter the most. 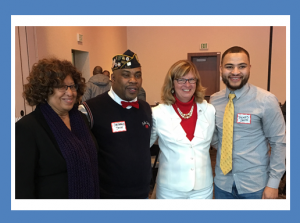 Last month, I met Thomas Smith and his father, Christopher, at the Lorain County Urban League’s holiday luncheon. Christopher is a disabled veteran and told me that he used to work at the college setting up chairs in our conference center many years ago. After working here, he became inspired to go back to school and eventually encouraged his children to earn college degrees — and did they listen! His two daughters, Parris and Chynna, earned college degrees while still in high school. Parris graduated from Lorain County Early College High School and Chynna earned two LCCC associate degrees while she was a student at Clearview High School. I loved reconnecting with Christopher Smith, second from left, and his son Thomas, right, at the Lorain County Urban League holiday party. Dorothy Johnson, LCCC Coordinator of the Office of Inclusive Excellence, left, joined me for the event. The Smith family shows what can be possible when the proper supports are available to provide an equitable experience for all. As we continue to move the needle on degree attainment, there are areas that deserve additional attention to equity – especially in helping minority and Pell eligible students complete their degrees. To ensure equity for all students, LCCC has created the Equity for Students Team (EST) to oversee and monitor the implementation priorities, strategies, and interventions that are intentional on closing the achievement gaps for students of color and underserved populations. 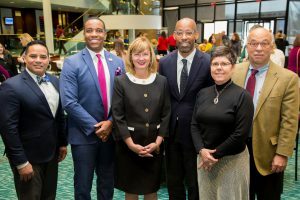 As we confront the obstacles hindering equity and social mobility in our county, Dodson reminded us that we may face a new set of problems – he calls these adaptive challenges – that arise as we shift away from the status quo. The answer to these challenges, he says, is community collaboration between organizations. Lorain County is home to number of outstanding organizations that work closely with LCCC. David Dodson, right, and our panelists Victor Leandry, David Hardy, Jr., and moderator Michael Collins provided great insight for our community. During our session with Dodson, a panel of local community leaders participated in a discussion moderated by Michael Collins, vice president of Jobs for the Future. During the discussion, Cynthia Andrews, president and CEO of the Community Foundation of Lorain County; Lorain El Centro Executive Director Victor Leandry and Lorain City Schools CEO David Hardy, Jr., all confirmed that residents — especially those in poverty — require connections and partnerships to succeed. LCCC is committed to doing our part to pursue our vision of empowering a thriving a community for all. If you would like to become a part of this ongoing conversation, please visit www.lorainccc.edu/connection and share your information. I look forward to hearing from you.